Ten years after switching from 2D die-design software to 3D, the management team at Oldenburg Metal Tech. knows well the benefits of designing dies in 3D, and readily recites their documented results. They include the ability to design larger and more complex tools in less time; run dynamic interference detection between die assemblies; eliminate die-assembly mistakes made on the shop floor; and efficiently organize files. The firm’s software arsenal (six seats of Logopress3 die-design software along with seven seats of SolidWorks, and new FTI forming-simulation software added in 2014) has served as the foundation for its rapid growth curve—evidenced by a seven-fold increase in revenue since 2005. Dies are getting larger and part complexity continues to be a challenge. Tolerances are getting tighter, requiring more restrikes, and there’s more use of in-die automation and assembly, and adjustability within the tools. All of this adds up to increased reliance on die-design/development software at Oldenburg Metal Tech. 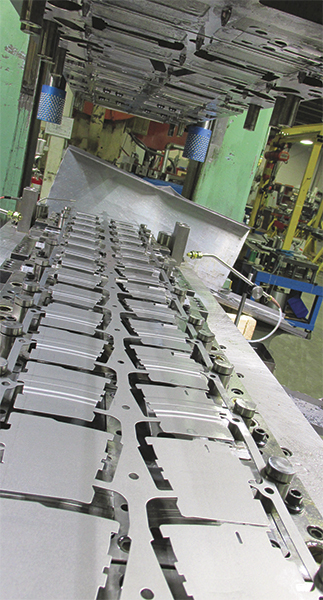 Schmit’s tale underscores an overriding trend in the metalforming industry. That is, as stampers look to eliminate downstream operations from their processes, such as additional press action to add details to parts, or assembly work in tapping or welding machines, their reliance on die shops to design and build highly performing and complex tools continues to grow. Die shops—designers and builders—then become the backbone of the industry. And, the die-design and simulation software they use becomes that much more treasured. Commenting on features within the Logopress3-SolidWorks software package that prove their mettle with just about every tool Oldenburg develops, tooling engineer Matt Bunkelmann first cites collision detection. With SolidWorks, he says, the designer quickly checks bolts, nitrogen springs, pad retainers and other components for interferences. “Logopress3 then allows us to actually simulate the designed tool in a virtual press,” Bunkelmann explains, “lifting the strip and feeding the material forward, watching stripper movement and how the part forms, checking clearances on the blocks and ensuring that there is no interference. Oldenburg tooling engineer Matt Bunkelmann cites collision detection with SolidWorks and Logopress3 as key software features that help create bulletproof die designs. “We can run collision-detection and die animations in just a few minutes,” he says. Of course, the rubber meets the road when tools designed using collision detection make their way to the shop floor for build and tryout. 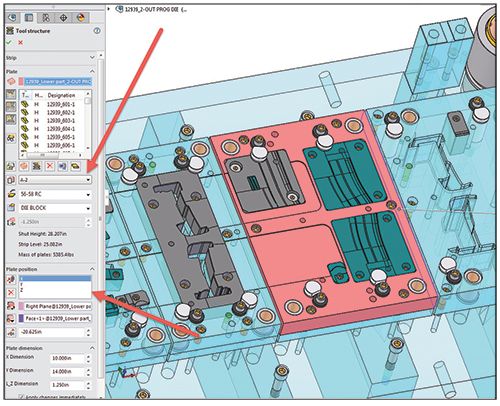 Other features that help generate bulletproof die designs include strip layout (in 3D CAD for measuring, and in 2D for customer review) and flat-blank creation directly from solid models of stamped parts. Logopress3 Tool Structure is used to automatically mate the strip assembly into the die assembly, and then insert plates. All plates can be controlled from one command manager. For example, cutting punches can be mounted—all holes cut through all plates with proper clearances—and punches that were in the strip can be derived and inserted into the assembly. Another big timesaver is the exhaustive tool-component library housed inside of Logopress3, containing all of the industry-standard components designers need to quickly spec bolts, dowels, nitrogen cylinders and all of the other details called out in a complete die design. The convenience of the library takes on a new level of importance as dies become larger and more complex. Die designers now also must be able to simulate their designs virtually, “or we simply won’t get the work,” says Schmit. Hence the decision, in 2014, to add FTI’s one-step Fastform Advanced and FastIncremental simulation software to its collection. Fastform Advanced is a regenerative and associative formability tool that, FTI says, identifies 90 percent of forming-feasibility issues during die development, and reduces the number of required incremental runs. FastIncremental then provides a detailed virtual die tryout, using features such as automatic blank-size calculation and automatic binder closing and wrap. “The software—SolidWorks, LOGOPRESS 3 and now FTI—has allowed us to grow, and will allow us to continue to grow,” says Schmit. “And not just in design and build—we use Logopress3 every day for quoting, to calculate progression width for example, because tool size is a big price driver. We can quote more quickly (in three days or less typically), and in turn complete more quotes than ever before. And, the quotes are more accurate thanks to the preliminary work we can quickly do using the software. “Just in the last year our output has increased 20 percent (the shop produces some 120 dies/yr., with a crew of around 50 employees), without having to add another tryout press,” summarizes Oldenburg operations manager Jeff Decker. “There used to be more checking and reworking on the floor, now that’s not an issue. And, because we trust the designs, our skill level in the CNC department isn’t as critical.” To support such an increase in production, the firm recently established a wire-EDM shop with six state-of-the-art Mitsubishi machines. “Obtaining a quick return on investment in the software—Logopress3 and FTI—is a no-brainer,” Decker continues. “Yes, simulation in the design suite dramatically reduces press time for die tryout and fine-tuning, and press time is king for us. But we’ve also found that we’re earning new business because we have those capabilities inhouse. That allows us to support our customers’ increasing use of design for manufacturability—we can efficiently work with them on design iterations to ensure that their part designs are in fact able to be manufactured.